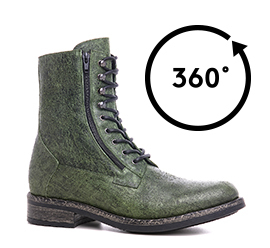 Elevator boots in dark green calf leather with unique black shades for a used effect, side zip and laces. The sole with a special vintage effect is made of natural rubber. A boot with an inner elevator system up to 4 inches (10 cm) featuring handcrafted details for a grunge-rock look that will enhance any casual outfit.